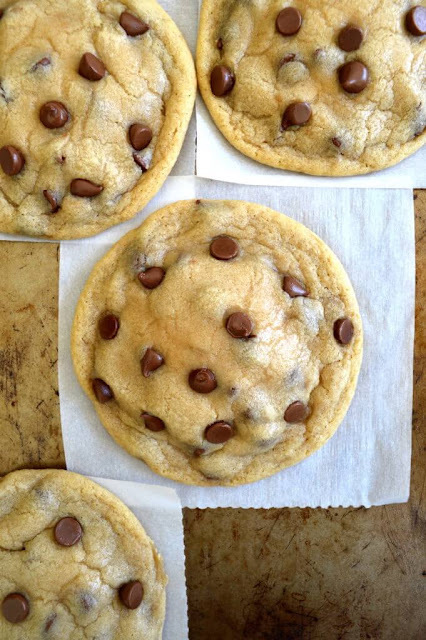 Okay, this officially one of my favorite chocolate chip cookie recipes EVER. It might even be number 1, because I can’t think of another cookie I’ve had in years, that matches how soft, insanely chewy and perfectly sweet this Nutella stuffed chocolate chip cookie is. I’ve made/had a bunch of chocolate chip cookies over the years, but of the ones that claim to be the best, I’ve found a bunch of them to be either too cake-y, too complicated to make, too cloyingly sweet, or they stay soft for one day and turn crisp and hard in 24 hours. 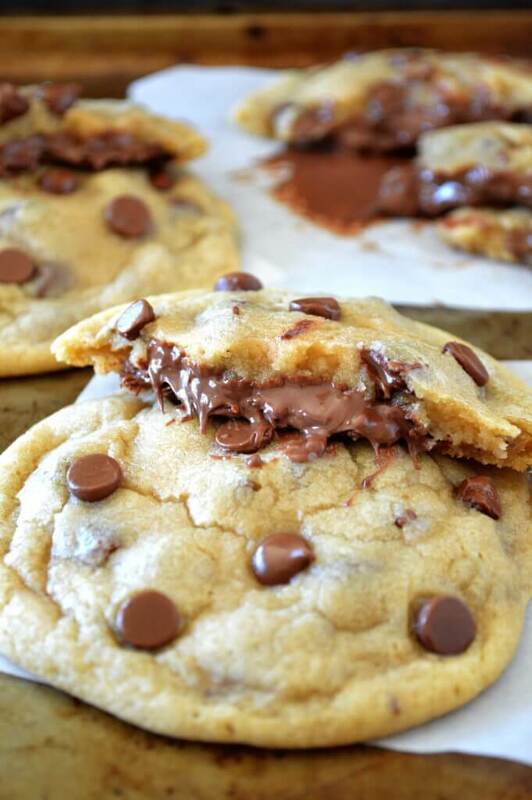 It was about time for a Nutella recipe to rear its beautiful head here, and these huge & chewy Nutella stuffed chocolate chip cookies are an awesome start. Dessert Serves: 10 large cookies! 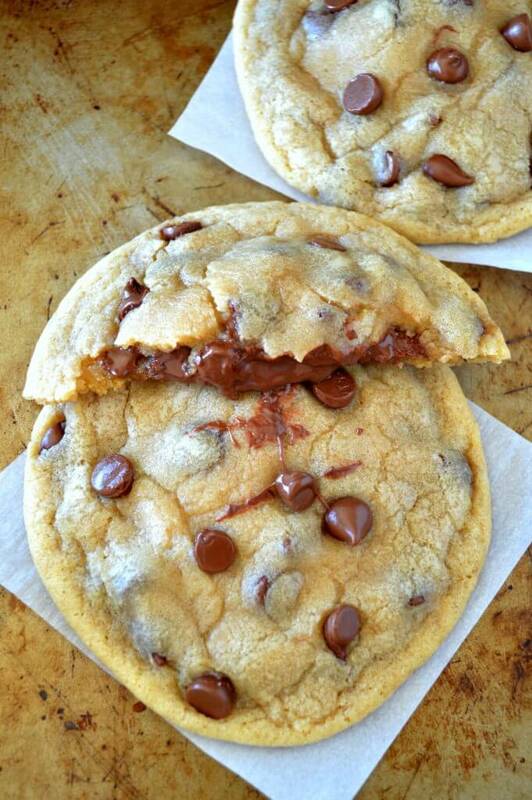 Soft & Chewy Nutella Stuffed Chocolate Chip Cookies - super chewy, bakery style, gigantic nutella stuffed chocolate chip cookies! So unbelievably soft, moist, and CHEWY! Microwave butter for about 40 seconds, until it’s just barely melted. In a large bowl, beat the butter, brown sugar, and white sugar until creamy. Add the vanilla and egg and beat for about 10-15 seconds, until the egg is just incorporated. Slowly add the flour, baking soda and salt. Mix until dough crumbles form. (Add more flour 1 tablespoon at a time, until the dough is dry enough to work with!) 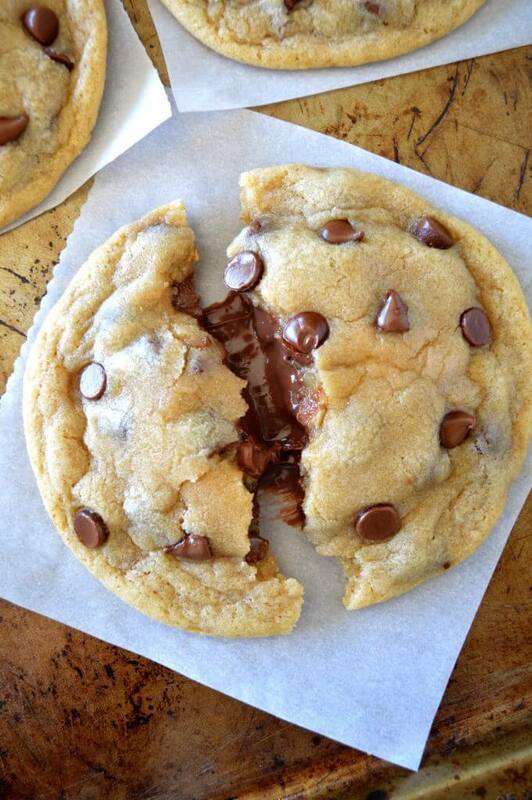 Add the chocolate chips and use your hands to incorporate them into the dough. Take your sheet of frozen Nutella out of the freezer. Divide the dough into 7 large balls (leave a little bit of dough in the bowl), then flatten each ball (not too much! ), leaving a slight indent in the middle of each. Place a Nutella ball into the indent. Mold the rest of the ball to cover the Nutella and use excess dough to fill in any gaps. Place your sheet into the refrigerator for at least 1 hour to chill the cookies before baking. Bake for about 9-11 minutes, until they look puffy and just about done. They will firm up as they cool. Enjoy! !